It may have taken five years at nearly 250 sites but a research team's persistent digging throughout northeastern India have paid off. 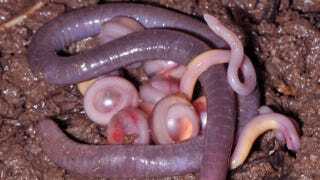 Say hello to science's newest family of caecilians—legless amphibians—the Chikilidae. The Amphibia class is made up of three orders: frogs, salamanders, and caecilians. Caecilians are less well known as the other two in large part to the fact that they generally spend their entire lives living underground and among heavy leaf litter. They also differ from the other two orders—aside from the whole "no legs" thing—by having smooth skin and hatching, not as tadpoles or newts, but as fully-formed replicas of their parents. The females appear to be very diligent mothers, fasting for months as they watch over their incubating eggs. A team from University of Delhi and led by S.D. Biju made the discovery after nearly five years of work at 238 sites throughout the populous northeast area of the country. Their findings were published today in the journal Proceedings of the Royal Society B. "Caecilians are the most cryptic group of animals, and it's not possible to identify whether it's a new species or genus or family just after collecting it," Biju told BBC News. "We studied the molecules (DNA) and the morphology, both internal and external, to identify the species." Finding even a single new species of vertebrate is a rare feat for a biologist, especially outside of rainforests, so to find an entirely new family in a populated area is quite impressive. It could also, however, spell trouble. "We found them not only in the forest area but also very close to human settlement," Biju explained. "So conservation of this group is extremely challenging."